Depiwhite.M is an invisible protective cream specifically formulated for pigmentation disorders such as pregnancy mask. Thanks to its innovative and patented combination of sunscreens and actives, the Depiwhite.M photoprotective care allows a very high protection over the entire UVA / UVB spectrum and a complementary protection against visible light of high energy (blue - purple). 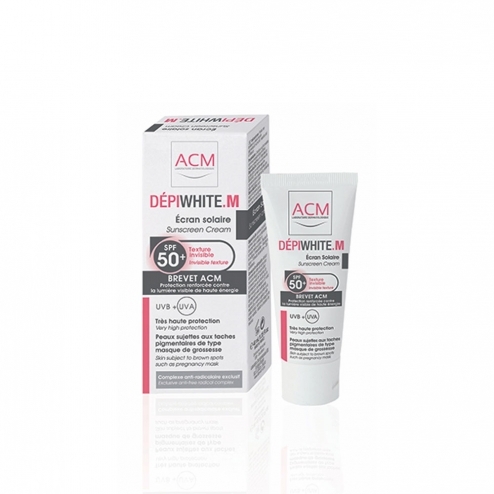 Depiwhite.M has been specifically developed for pigmentation disorders such as pregnancy mask. Depiwhite.M also contains moisturizing and antioxidant active ingredients that help fight against skin aging. Its texture is fluid and invisible. Photostable - Water resistant - Fragrance free - Paraben free. Apply daily throughout the year on the face to limit the risk of appearance and aggravation of pigment spots especially mask pregnancy type. INCI Formula: Aqua (Water), Diisopropyl Sebacate, Diethylamino Hydroxybenzoyl Hexyl Benzoate, Bis-Ethylhexyloxyphenol Methoxyphenyl Triazine, Ethylhexyl Triazine, Methylene Bis-Benzotriazolyl Tetramethylbutylphenol [Nano], Titanium Dioxide, Glycerin, Caprylic / Capric Glycerides, Cyclopentasiloxane, Potassium Cetyl Phosphate, Glyceryl Stearate, PEG-100 Stearate, Pentylene Glycol, Pearl Powder, Xylitol, Tocopheryl Acetate, Ascorbyl Glucoside, Melanin, Coco-Glucoside, Polyhydroxystearic Acid, Stearic Acid, Alumina, Coconut Alcohol, Ethylhexylglycerin, Decyl Glucoside, Propylene Glycol, Phenoxyethanol, Xanthan Gum, Sodium Hydroxide, Potassium Sorbate, Chlorphenesin, Polydextrose, Disodium EDTA, Citric Acid.